The Australian Magazine Awards shortlist has arrived. Check out which entrants made the cut and join us to celebrate success in publishing. 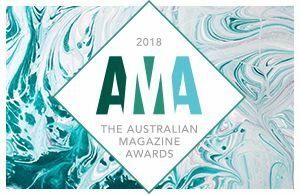 For the first time, the winners of The Australian Magazine Awards will be announced at an evening awards ceremony and party on 22 November at Ovolo, Woolloomooloo. As a nod to multi-channel publishing, we have for the first time created a category for digital-only magazine brands, while we have expanded the Special Interest brand award to also include Hobbyist brands. We’ll also be revealing which legend of Australian publishing has made it into the Hall of Fame, sponsored by Magazine Networks, this year on the day. Congratulations to all the finalists. We hope to see you on the day, get your tickets here.